Not to be confused with Bruiser. 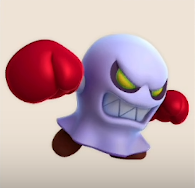 Broozers are boxing ghosts that first appear in New Super Mario Bros. "Broozer" is derived from the words "bruiser" and "Boo". They are humanoids wearing a grey sheet over their body, brown shoes, and deep-red boxing gloves. In New Super Mario Bros., they have angry yellow-orange eyes with Boo-like smiles containing sharp teeth, but in every later appearance, the eyes are sunken with a green hue, and the smiles become angry scowls, bearing much larger teeth. They make sharp hissing noises as they attack - either made by them or the tailwind of their punches. Six Broozers surrounding Mario in New Super Mario Bros. In New Super Mario Bros., they are found in two locations: World 5- and World 5-C. Broozers blindly run into the direction of Mario (or Luigi), punching at anything in their way. These enemies can be useful, and they can punch otherwise unbreakable bricks, allowing Mario to reach items and Star Coins that could not otherwise be reached. Mario must jump on a Broozer three times to defeat it. However, a Ground Pound, being hit by Mario doing a Shell Dash, a Fireball or walking through them as Mega Mario can defeat these enemies in one hit, with the latter making the Broozer spinning erratically while falling defeated. Also, because of their bad traction, Broozers often can be forced to fall into gaps in the floor by running past their target and being unable to stop. They seem to possess little intelligence, as they can be easily tricked into running past Mario and into a hole, and don't notice him when he hides in a blue shell. In New Super Mario Bros. Wii, they appear in World 7- . They have the same function as they did in the original New Super Mario Bros., except this time, in addition to breaking bricks, they can knock over barrels and cause them to roll down stairs. They are imperative to finding a shortcut to World 7-5, as Mario must lure one to bust open a hidden, unseen door so he can take the secret exit and unlock the level. Although they can be frozen by Ice Mario, Broozers cannot be picked up afterwards. 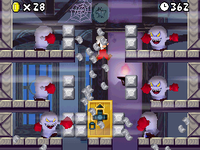 In New Super Mario Bros. U, they appear in two Ghost Houses: the Which-Way Labyrinth in Soda Jungle, and Spinning Spirit House in Meringue Clouds. Broozers make their Paper Mario series debut in Paper Mario: Sticker Star. Two of them appear in Bowser Jr.'s Flotilla, where they are battled alongside a Boomerang Bro, their only appearance in-game. They attack by hitting barrels into Mario, and floating up to him and punching him. After taking some damage, they will start flailing their arms around, dealing damage to Mario if he tries to attack them up close, therefore preventing Mario to do any direct attacks. The Rampage mode ends in a few turns. Then they revert back to their normal attack pattern. After winning the battle, there is a high chance that the player may earn a Barrel sticker. Broozers make their Mario & Luigi series debut in Mario & Luigi: Paper Jam. They appear as enemies in Neo Bowser Castle in both normal and paper forms. A Broozer's main attack is to stand in front of its target and punch them, which knocks them off-screen and unable to act (or be targeted by attacks or items) for several turns. Normally the Broozer punches immediately upon moving into position, but it can also do a fake-out and pull its punch; if its target jumps too early, its delayed punch always hits. The player can tell when a fake is coming because the Broozer swings its arm up and down as it approaches, instead of the regular arm spin. For either punch timing, the target can jump to dodge and counter. Broozers also receive a Power boost when they are attacked, including first strikes but not counterattacks. They also share a barrel attack with their paper counterpart where they drop a barrel in front of themselves and ram into it, causing it to fly into their target, and then follow it for an arm-flailing hit. The barrel's trajectory depends on whether it is a paper barrel or not. If the barrel matches the Broozer, it must be jumped just after it is bumped. If a normal Broozer hits a paper barrel, it soars over the target's head, and so is dodged by not jumping. Either way, the Broozer itself must be jumped over to complete the dodge and counter. Broozers appear again exclusively in Minion Quest: The Search for Bowser in Mario & Luigi: Superstar Saga + Bowser's Minions. They fight against and alongside Captain Goomba on his journey to rescue his king. They are found in the levels Power Play, Return of the Koopa Cruiser, Chain Chomp and Spike Stomp, Rumble in the Castle! and The Mightiest Minions. Minion Quest: The Search for Bowser bio: Those deep red gloves are proof of their strength. They especially like to break mechanical things. In Mario & Luigi: Bowser's Inside Story + Bowser Jr.'s Journey, Broozers make an appearance in the Bowser Jr.'s Journey mode, where they are enemies and recruitable allies. They are strong against Alarm Bob-ombs and Mechakoopas. Bowser Jr.'s Journey bio: Those deep red gloves are proof of their strength. They especially like to break mechanical enemies. Broozers make their Mario Party series debut in Super Mario Party, where they appear as non-playable characters. They are featured in the Croozin' for a Broozin' minigame, where the players must outrun a group of them. Artwork of a Broozer can also appear in Absent Minded, as one of the characters that can be chosen. Spanish Fantasmón Portmanteau of the word "fantasma" (ghost) and the augmentative suffix "-ón". Italian Tirapugni Literally "punch thrower". This page was last edited on April 16, 2019, at 17:51.